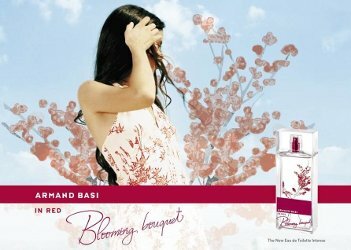 Spanish designer Armand Basi has launched In Red Blooming Bouquet, a new fragrance for women. In Red Blooming Bouquet is a flanker to 2002's In Red. In Red Blooming Bouquet was developed by perfumer Alberto Morillas. The notes include mandarin, ginger, violet leaves, watery accord, jasmine, lily of the valley, rose, gardenia, cedar, sandalwood and musk. Armand Basi In Red Blooming Bouquet is available in 50 and 100 ml Eau de Toilette.